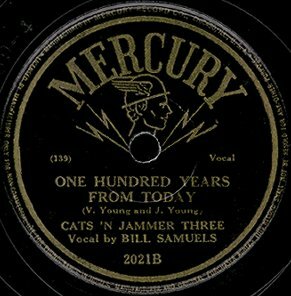 "One Hundred Years From Today"
Above: The second record by The Cats 'N Jammer Three. They had nine records released between 1946 and 1947, all on the Mercury label. Click on an option below to listen to "One Hundred Years From Today" in RealAudio. Above: Mercury label montage. (Left) Mercury Ad from February 1952. 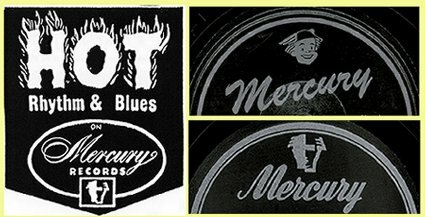 (Top Right) Mercury 78 rpm label logo from 1947. (Bottom Right) Mercury 78 rpm label logo from 1956. The label recorded many RnB vocal groups including The Ravens, Red Caps, Billy Williams Quartet, Cashmeres, Griffins, Platters, Penguins, etc. Ad photos included herein are from "First Pressings - The History of Rhythm & Blues". To obtain copies of this excellent series of books, 1950 - 1958, click HERE.